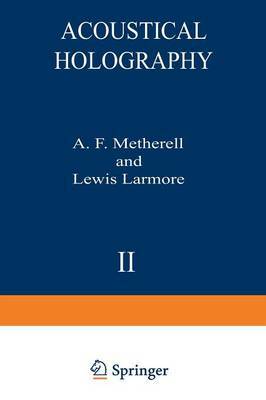 This volume presents the proceedings of the Second International Sym- posium on Acoustical Holography, which was held at the Douglas Advanced Research Laboratories on 6 and 7 March 1969, fifteen months after the first symposium. Space was limited to about 110 seats, with representatives from nine countries attending. These countries included Canada, England, France, Japan, Mexico, Scotland, Sweden, Switzerland, and the United States. The symposium consisted of 21 formal papers. The twenty second, by Dr. U. Fehr, was not read, but is included in these proceedings. The manu- script of the interesting paper on acoustic propagation in a turbulent medium which was read by Dr. O. K. Mawardi was not received in time for publication in these proceedings, and we look forward to its publication perhaps at a later date in the open literature. In addition to the formal papers there were three informal presentations at the end of the meeting which were given by Dr. A. Lohmann, by L. A. Cram and K. O. Rossiter, and by T. S. Graham, which are also included in these proceedings. At the end of the formal presentations Dr. Lewis Larmore summarized the symposium and discussed some of the highlights. For the symposium summary and a summary of these proceedings the reader is referred to Chapter 1.